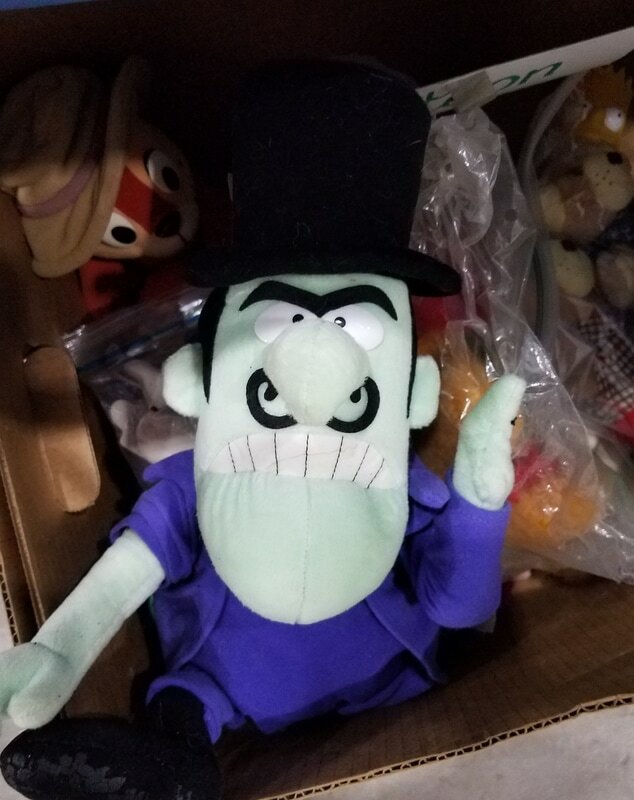 One might think murder is nothing to play around with, but it's funny how many toys and games around the vintage toyshop have some kind of mystery connection. Of course, there are the ubiquitous (and multiple) versions of Clue, but here are a few of my other favorite finds. And it goes back even further before that. How about this black and white favorite? And what would mystery be without a good villain? 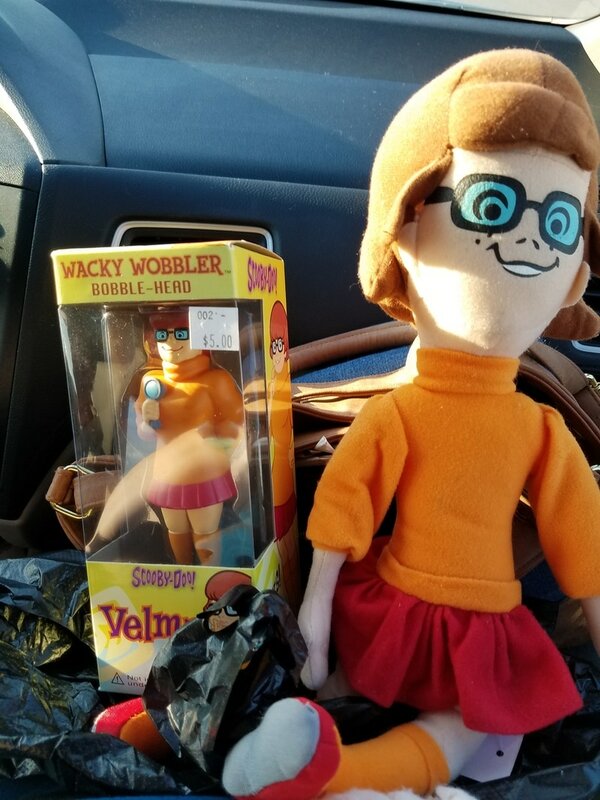 As part of our Killer Characters summer giveaway, I'm offering you a chance to win your own Velma Wacky Wobbler. (The one pictured above in the box is mine!!) Just leave a comment below by noon (Eastern) on Saturday, July 1st, and I'll choose one winner at random! Be sure to include your email in a safe spambot-free format, ie, yourname AT provider DOT com! I'm launching Barbara Early's Very Merry UNnewsletter. So for games, giveaways, and yes, the occasional news of my books, subscribe now, and I'll enter you in a giveaway to receive your choice of either 1 hardcover copy of Death of a Toy Soldier, OR 1 Advance Reader Copy of Murder on the Toy Town Express (releasing in October). Just mosey on over to my website to find the form to enter, or use this happy and convenient link: Sign up for Barbara Early's Very Merry UnNewsletter! This bonus giveaway runs until July 15th. What a blast from the past those games are! I don't think I played any of them unless a friend had them, but the Nancy Drew one--would have loved to have had that! Thanks for the cute giveaway! 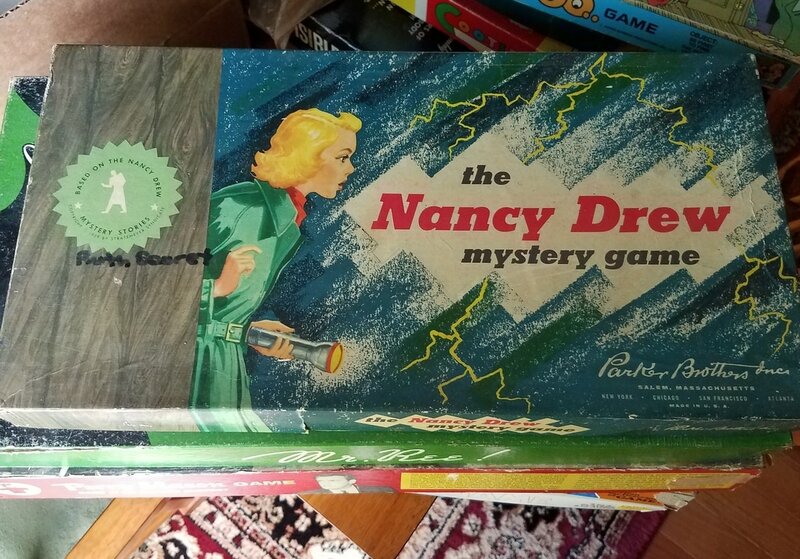 The Nancy Drew game is not easy to find, but they sometimes pop up at shows and on eBay. Still haven't played it yet! What a fun post! I used to love watching old reruns of Perry Mason--didn't know there was a game. I am on Team Frank also! Thanks for the chance to win. cking78503(at)aol(dot)com. There's a game for so many shows. I'm still looking for a copy of the Murder, She Wrote game--because there was one. Thanks, Brittany. Clue is such a great game for kids. Makes them think, while they're having fun. Love vintage toys! Thanks for the chance to win! mcastor07(at)Gmail(dot)com. I think the nostalgia is what makes them collectible. And most were quite reasonable at the last show I attended. I never had these particular toys. I do have clue board game and a newer version of a Perry Mason Board game. Scooby Doo has always been my favorite cartoon. I didn't have any Scooby related toys but my daughter did, she had the Mystery Machine and the whole gang. Fun! 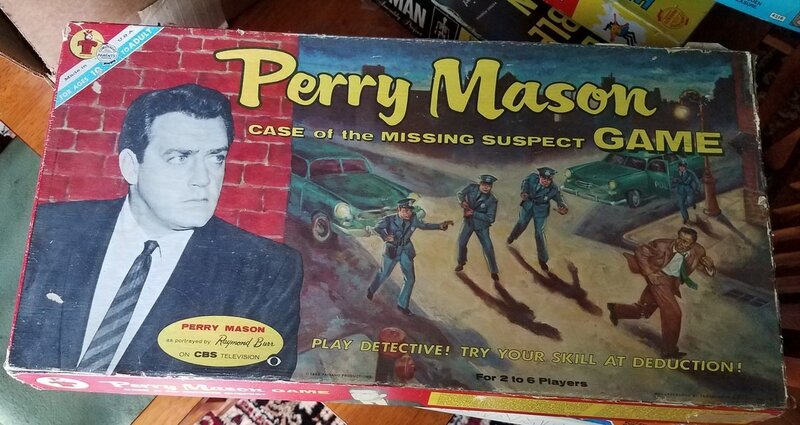 I've not seen a newer Perry Mason game. I'll have to look it up! So many great mystery board games. Thanks for the contest. monstercreed1@yahoo.com. I love board games. I'm beginning to develop a taste for some of the more complex German games now. That is, when I can find others who want to play. I have never seen or played those games...but I am sure I would have...mysteries were always my favorite books...Trixie Belden was the best! Sad to admit that I think I missed Trixie completely when growing up. I have started to pick them up when I see them at used book sales. I know that feeling too. Although I was a little tyrant and forced all the adults in the family to play with me. That might be why they taught me adult card games when I was rather young, because they grew tired of the kids games. I made a small fortune in poker, BTW, which happens when you're ten and everyone else is, well, less than sober. Yes, we play a lot of games in our house! Yes, we often raise our kids the way we wish we were raised. I think we played more games with our daughter than anyone played with me when I was a child. And we all still enjoy games. I've seen a few Flintstone things at the shows, but, come to think of it, not as much as I thought there would be. Hold onto it! Loved board games growing up and when the kids were little. Cute giveaway! Signed up for newsletter. WE are such Scooby Doo fans in my family. Halloween 2005, I was Velma, my husband was Shaggy, my sister Daphne, her husband was Fred. Her toddlers were 3 and 2, both were Scooby, and I made the 11month old baby into a box of Scooby Snacks. It was the best Halloween memory. and still to this day, my favorite cartoon. Fun! My son-in-law and his two sisters did that one year. Such a fun picture! I still have all my Nancy Drew, Hardy Boys, Dana Girls, Trixie Belden and Bobbsey Twins books! Would have loved to have had that Nancy Drew game! And, of course, I'm still a he fan of Scooby Doo!Now a big fan of Barbara Early, too! By the way - I work in a library and I happen to be on the Book Selection Committee - making sure we have your books! Exactly, they're the gateway. Fortunate for all us mystery writers! I really wish I had some of my vintage toys and my Nancy Drew books from when I was young. It was always so much fun playing board games. Really enjoyed the trip dowm memory lane and I also enjoyed reading "Death of a Toy Soldier" and I'm looking forward to reading to the new book. Subscribed to the unnewsletter. These are great games & I do love a dastardly villain. Even as an adult I love Scooby Doo. I have that exact same Nancy Drew boardgame. Thanks for the chance. 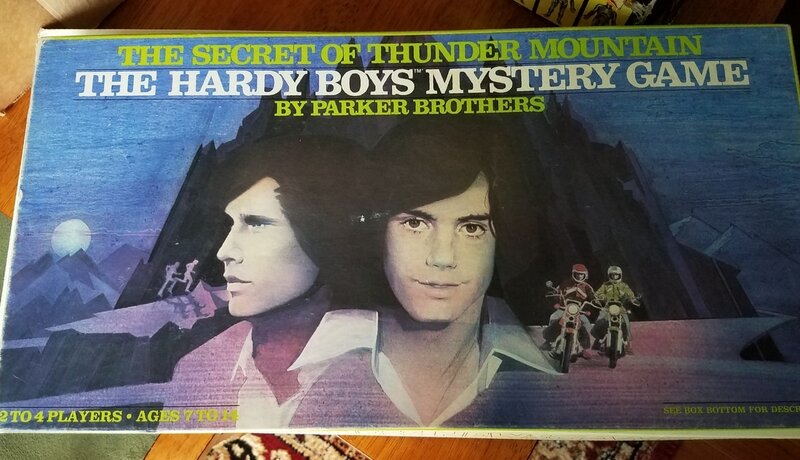 My dad collects early editions of the Hardy Boys. I had a thing for Joe when I was a kid! We're both big Scooby Doo fans. I collect Monopoly games and have all types of board games. I have read the Nancy Drew books but I never knew there was a game. I signed up for your newsletter and can't wait to receive it. Thank You! I have all of the Nancy Drew books and my oldest granddaughter is reading them now. My kids loved Scooby Doo and the Hardy Boys. Thanks for the chance to win. I LOOOVE the Nancy Drew PC games and I have Scooby Doo Clue!Thanks for the chance! Was not aware of these games. These vintage games are great! I wish I had an opportunity to play them. j dot marshall 730 at yahoo dot com Thanks for sharing!! I loved being reminded of these great toys and games. Thanks for sharing! I've never seen any of these board games, but would love to add them to my collection! I normally play Monopoly, and if it weren't for my furbabies trying to help me play (see knock all the pieces everywhere and try to eat them, same with the money and deed cards) I'd drag one of mine out more often (I currently have the Deluxe Edition and the New York edition...the Manhattan square has the Two Towers on it, so I'm never getting rid of it, ever). I also have a copy of Scrabble in Spanish (ever since taking the class in high school and discovering that version of the game there I've wanted my own copy---we used the class copy to study our vocabulary words, of course :P ). I've been a fan of Scooby Doo since I was little (and yes I remember all of the old series, my favorite of course being the original, was never a fan of A Pup Named Scooby Doo though) and my favorite of course is Scooby. :D My favorite human is Shaggy, and I cannot STAND Scrappy Doo! I thought it was the most hilarious thing ever when they made him the villain in the first live action movie. I love both the Hardy Boys, but if I had to pick, it would have to be Joe (doesn't hurt that at the time I was a huge Shaun Cassidy fan). 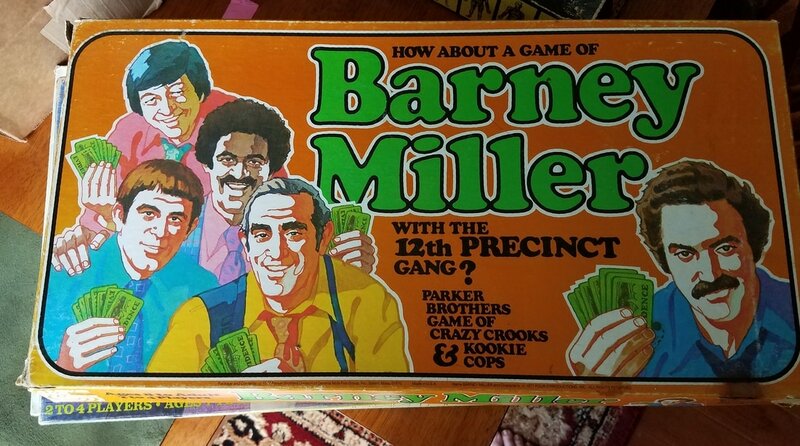 I watched Barney Miller every week with my grandparents, but couldn't tell you the names of any of the characters now other than Barney and Fish. I've always been a HUGE Perry Mason fan, and have read every book in the series that our county library has (which is most of them). My first mysteries were Nancy Drew, the Hardy Boys, and Encyclopedia Brown. I kept reading the Nancy Drew and Hardy Boys series up into the hundreds until I could no longer find them at bookstores on a regular basis, then fell so far behind I figured I'd never get caught up. My first "adult" (as in not geared towards kids, get your minds out of the gutter!) mysteries were Agatha Christie, and I've read all of hers and at one time owned most of them, till they got water damaged. Now I own maybe three or four of them, including N or M? (one of my favorites) and The ABC Murders. I signed up for your UNnewsletter, using christineocheallaigh at yahoo dot com. What a fun post. It would be awesome to win the Velma Wacky Wobbler. Thank you for this opportunity! I would love to win a Velma Wacky Wobbler!! I signed up for your UNnewsletter. Thank you so much for the chance to win!